I've finally got round to putting into action some random ideas that have been rattling round what passes of my brain. I want to start a new layout that's a bit different to Wood Bros. 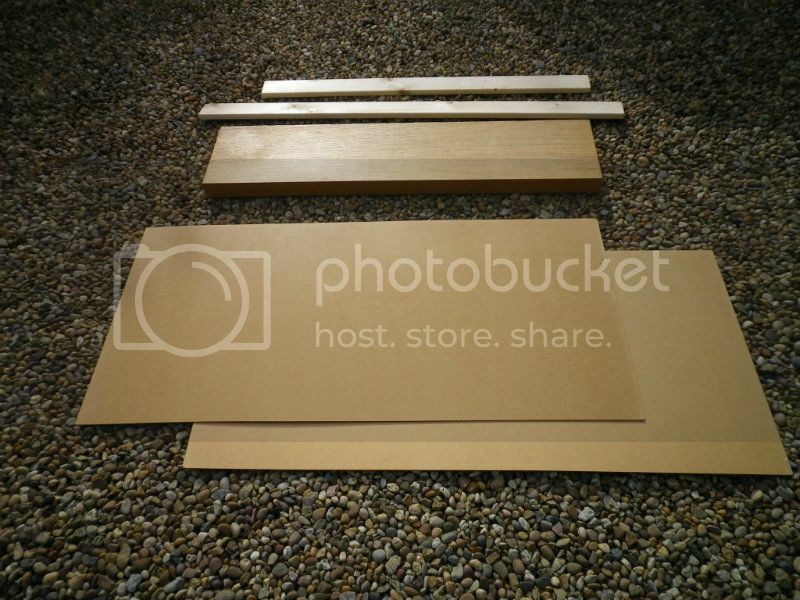 I decided that it would be a shelf layout and as I have an Ikea LACK shelf that's seen better days in the back of the garage I thought I could use that. It's 3' 6" long and 10" wide and 2" deep, so that's my starting point. The scenery will feature plenty of height above the track level which I hope to build up with pink or blue foam sheets - there are lots of tutorials on YouTube on this. I could do with some guidance on the best adhesive to use for this - I believe that PVA isn't suitable. I also want some level below the track, so I will use the depth of the LACK to produce that. I expect my progress will be characteristically slow, and I'll post as things progress. Last edited by Bilco on Sat Oct 20, 2012 6:26 pm, edited 1 time in total. If at first you don't succeed, cheat. Too soon old, too late smart. In order to get some terrain level below the track I cut one piece of hardboard to the length of the shelf and 3" wider (nominal) to take a piece of the batten. I used Wickes Instant Grab adhesive to fix the LACK to the bottom sheet, and this is sitting in the garage under lots of weight at the moment. Tomorrow I'll glue the piece of batten in front of the LACK, with some brackets to keep it rigid. All rather over-engineered and weighty, but I like that. The rest of the hardboard is going to make backboards and a frontage.That will mean some joining but I think I can make it all fit and be rigid. At the moment I can't find any pink or blue foam insulation board - Wickes only have huge sheets of cream foam with silver foil front and rear today. Anyone know where I might find some? It feels good to be doing something - after getting Wood Bros into an exhibitable state I had come to a bit of a halt. Hours of fun! Bilco wrote: At the moment I can't find any pink or blue foam insulation board - Wickes only have huge sheets of cream foam with silver foil front and rear today. Anyone know where I might find some? Suggest you try a Local Builder's Merchant which is where I obtained my sheets. I've not had any problems using a cheap PVA to adhere small pieces of Blue foam to other materials, e.g wood, plasticard or other pieces of Blue Foam. If my memory is working correctly there is a UHU adhesive called POR that is specifically made for use with these Foams - BUT it's not cheap if you plan to use it over large areas. I've used this but at the moment haven't a clue as to where the tubes are hence my memory comment and reason for using PVA! Stick with PVA, apply to both surfaces and allow to go tacky then join them; leave for around 12 hours and you'll have a strong bond. Look forward to seeing the progress. When B&Q stopped selling the pink insulation board, I found that it was only available at Wickes, the extra large branches not the small ones. The nearest convenient store for me which might stock it was near Birmingham, just round the corner from IKEA. Considering the company is based in the Wirral which is the North West this is shocking. Luckily I have sufficient for the moment, but does prove to me that buying something when I see it is better than waiting till I actually need it. To stick the stuff I recommend 'Hard as Nails' especially as it can be bought in pound shops. Thanks for the tips on sticking the foam - all I need now is to find a source. rue_d_etropal wrote: buying something when I see it is better than waiting till I actually need it. Yes, I know the feeling. I saw pink foam in Wickes a couple of months ago, in handy 1200x450 sheets, so of course they don't have it now I want it. One of the problems with Spaceboard supply, if not the main problem, has been that it is being sold as part of various eco related funded projects, ie subsidised by grants, so when those grants run out the big shops don't sell it. I think this is why B&Q stopped selling the Spaceboard stuff, although they are still listed as selling other products from the same company. If one branch of Wickes has being selling it, I would ask if they can get hold of it. You are the customer, the stuff is being manufactured, and Wickes are quoted as suppliers on the Spaceboard website, so they should be able to supply. There are all sorts of get out clauses which allow them to do this, but they should still try and do their best for a customer. It was doubly frustrating for me as I have being telling fellow modellers about this wonderful material, and then it becomes difficult to get hold of. There are other similar products, but firstly most have this metal covering which has to be removed, and they are not the same thickness, so are not compatible. This stuff has been around for a long time so why now is it so difficult to get hold of. Interests: Rowland Emett influenced O-16.5 modelling. Occasional GN15 modelling. Sheds. 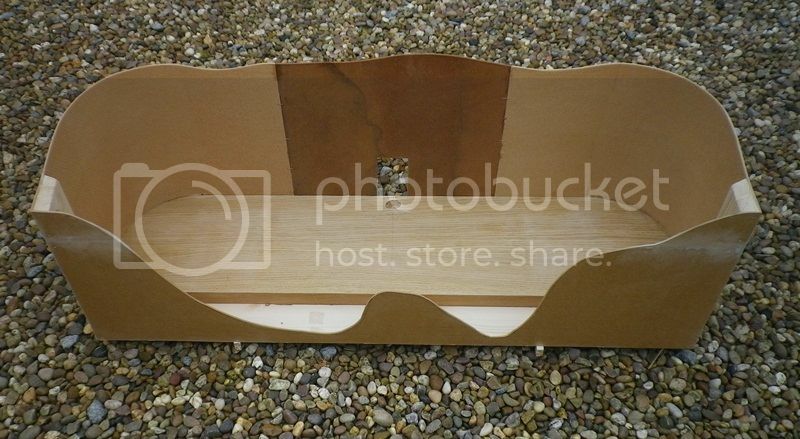 I have bought insulation boards from Selco Builders Merchants. I mentioned them in the previous foam insulation board thresd. 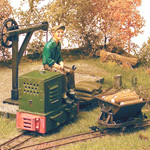 Railway Modelling inspired by the Holy Trinity of Rowland Emett, Colonel Fred Stephens and Oliver Postgate. Also postmaster for The Gower Islands Postal Service. If there is some new housing construction near you, there may be chance to forage for some. Today sees the baseboard built. After glueing the LACK to the hardboard base together with the 3" batten, I started on the back and front boards. First job was to cut the untouched sheet of hardboard into 3 equal pieces of 2'x15" (approx). The contours on the front are open to adjustment as the scenery progresses - when I can get some pink foam. The basic idea is that the line enters at the right side, splits into a passing loop, and exits into the mine on the left. The hole in the centre back is to allow me to reach the slide switch for the point at the right end of the loop (by sheer serenditipy, it was already cut in the gash off-cut I was forced to use - shown up by the different colour of the hardboard). Since I took these pictures I've painted the outside of the front and back boards with matt black, so it looks very smart. I'm going to be forced to do some track-laying soon! Last edited by Bilco on Fri May 17, 2013 4:35 pm, edited 1 time in total. I really like how things are looking at this point! The curving of the hardboard is brilliant... I need to abandon my thoughts of using mat board. How thick is the hardboard you are using? And what tools are you using to cut that hardboard, may I inquire? The hardboard I got from Wickes is 3mm, so has a bit of rigidity - not a great asset when it comes to bending it! As for cutting it - I used a cross-cut saw to cut the sheets into sections, a tenon or back saw for smaller work and a key-hole saw for the openings; for the curves in the front board I used an hand-held electric jig-saw. I also used a hole-cutter in my electric drill to start the openings at the ends. Thanks for the info Bill. 1/8 inch is the thinnest I've seen on the shelves at my local DYI here in the U.S. Bending without breaking that thickness of Hardboard appears to be quite an achievement! Bill great job. Rounding the corners of the backdrop adds the master's touch. 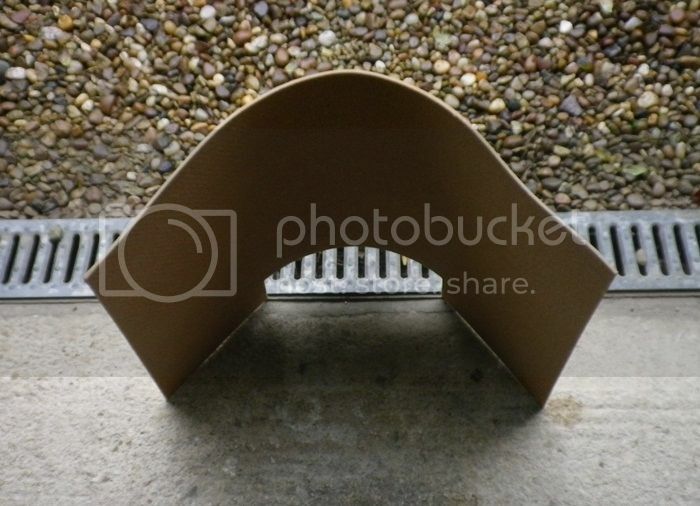 I worked in construction for a number of years (on and off) and we use to create arches with 5/8" drywall (about 15mm plaster board) using similar methods. We would set the boards on saw horses and spray with water and let gravity do the work. Looking forward to following the progress. I haven't used this personally but have specified it for years. My name is Geoff - a dabbler in all things narrow gauge and unlikely. Three weeks since my last post, I see! Well, I lost a week when the branch of the family from the IoW came to stay, although I did get a running session of Wood Bros with Second Grandson while they were here, which was great fun. These 8-year-olds seem to take to technical matters with no problem. For the last two weeks I've been busy with the layout but not achieving much. First up, I stuck cork tiles to the surface prior to starting track-laying. I even got as far as cutting grooves for the wire-in-tube (standard brass wire and styrene tube) point operating gubbins for the left-hand point. Then I found some 30mm thick expanded polystyrene (the white stuff that produces round bits that stick to everything) in the back of the garage, so I ripped off the cork tiles and stuck the white stuff down. 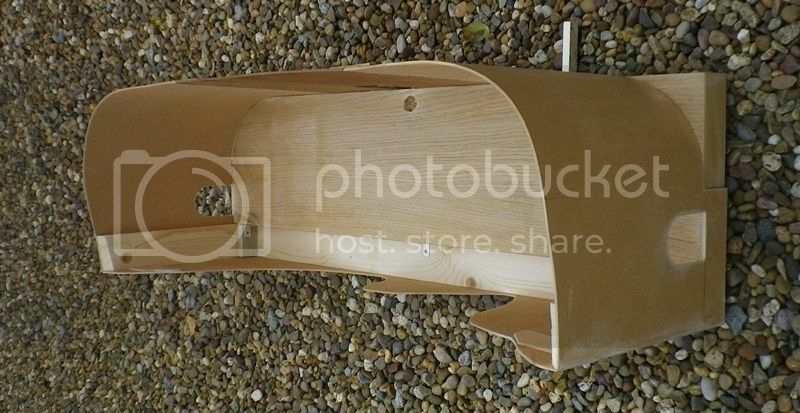 I didn't have quite enough to cover the length - it was 20mm narrower than the width, but I put the space at the back and the 'lectrickery will fit in there - so found a gash bit of poly in the back of the garage - not the same thickness, so I had to delicately saw off the excess - and sawed off too much, so I had to pack it up level with the rest. When that was dry I stuck a fresh set of cork tiles down on top - I didn't have quite enough left in the back of the garage, but by crafty cutting what I did have and deft fitting of the bits, I got the area covered. Now that there was an additional 32mm on top of the original surface the holes at the ends were too low, so I had to get the trusty hole-cutter into action and cut them higher. Also, when I had been getting ready to lay that first point, I realized that the hole in the back-scene was in the wrong place for the slide switch for the right-hand point, so it was filled in with a gash bit of hardboard from the back of the garage, and is now the site of the electrical connections. 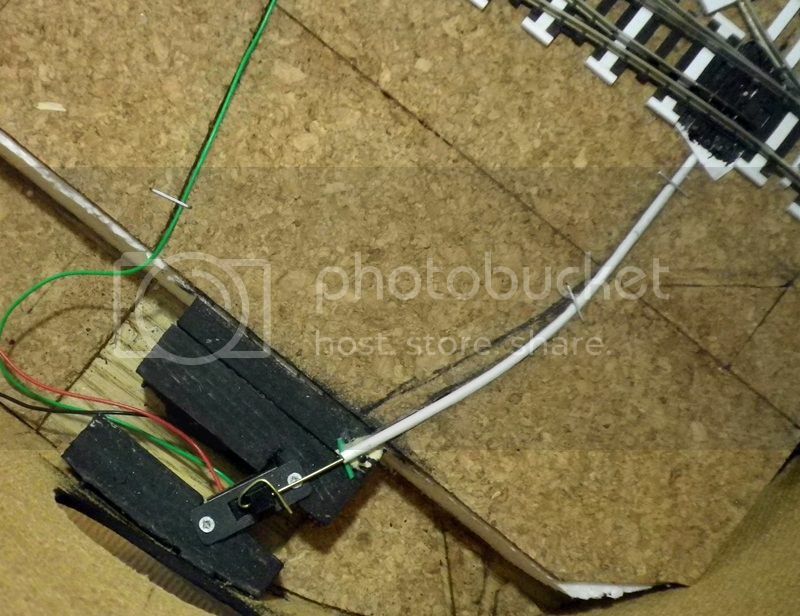 Also also, I realized that the site for the slide switch for the left-hand point was now too low, so I decided that the slide switches would both be inside the back-scene, reached through artistic circular holes - cue the hole-cutter again. Pieces of wooden batten were stuck in the 20mm gap, onto which the slide switches will be screwed. From the front - the 30mm poly and cork tiles, electrical connections, and wood blocks in evidence. The white at the top of the back-scene is acrylic paste to fill in the patten on the back of the hardboard, where some distant hills might appear. The rear, showing the electrical panel - 16v AC input, DIN socket for the controller, and two push switches for track isolation. The hole for the left-hand point (on the right) has been cut - I'm waiting to check the final position of the other slide switch before cutting the other one. Top view, showing the 20mm gap at the back. The heightened holes at the sides can be seen - I stuck more wood blocks inside them so that I can put brass nails on either side of the track and solder the rail to them, for extra secure fixing of the ends. Also seen are the grooves for the wire-in-tube and wire from the frog to the switch for the left-hand point. Today I finally got the left-hand point stuck down onto the cork, with the wire-in-tube and slide switch in place - careful critical-path analysis was required to make sure I didn't have to rip the point up again to fit the wire to the tie-bar - first solder the wire from the frog to the slide switch, then screw the slide switch down, then fit the wire-in-tube with the wire through the slide switch and fix down, then glue the point down. Now, a bit of advice please. I'm doing this work in the garage - in the front as the back is full of stuff I put away 'in case it's needed one day'. 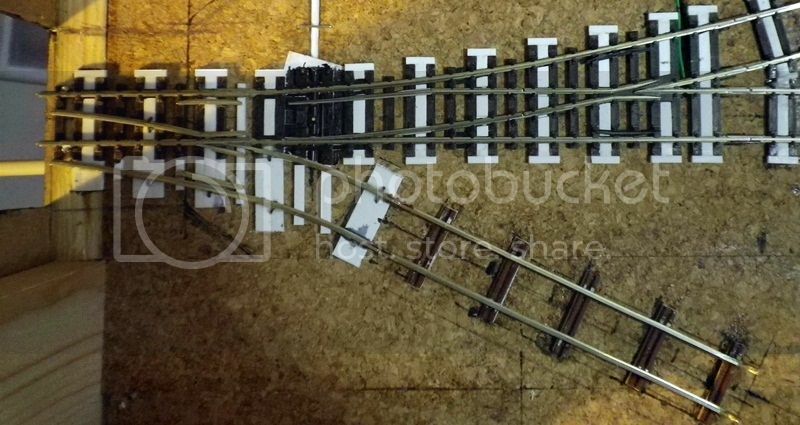 It's quite cool out there, so when laying the track do I have to allow for expansion of the rails when the layout is brought into the warm one day, and if so, how much? Would it be better to do the rest of the track-laying in the warm so that expansion has taken place, and then contraction back in the garage won't be so much of a problem? Right, all-in-all a sorry story of ad-hoccery and bodgement, but things have moved on, and the next instalment shouldn't be so long in coming - famous last words. Just quickly reading through, it would make sense to me to lay the track in a warm environment so some expansion has already taken place. Like the way the layout is progressing. Glad to see that I am not the only one who tries to design a layout and then has to change lots of things as I go along. 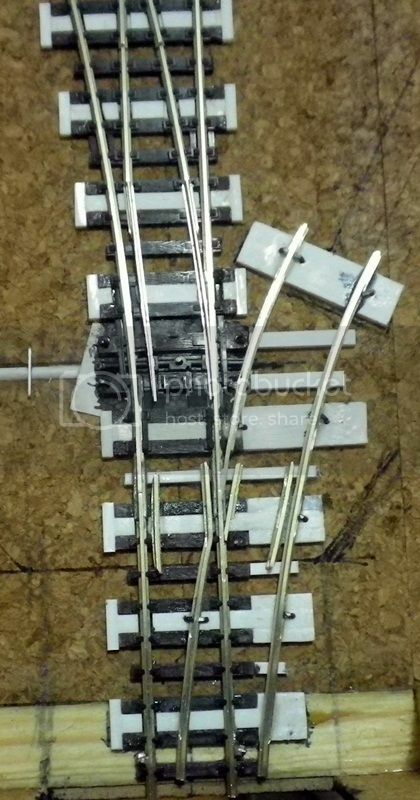 so when laying the track do I have to allow for expansion of the rails when the layout is brought into the warm one day, and if so, how much? Not sure how close nickel is to nickel silver (as far as expansion is concerned) but assuming that you are using nickel for the rails, that the temperature goes from 32F to 120F and your layout is 3'-6" long ____ Blah, blah, blah on the calculator ___ your rails will change approximately 0.002". Not really too much of a worry. Your REAL worry will be the baseboard itself as it absorbs moisture and dries out. But even assuming the worst possible case in both areas with a base board as small as yours I do not see any major problems. Although I must agree with Ian that you should lay the track in a warm environment. First to make sure that any expansion has actually taken place and second because you will be much more comfortable and will therefore, probably, do a better job. Ian, Adrian - Many thanks for your inputs. I shall definitely go for track-laying in the warm. It will also be done in a better light as well as comfort. I had come to realize the vunerability of the push-buttons. 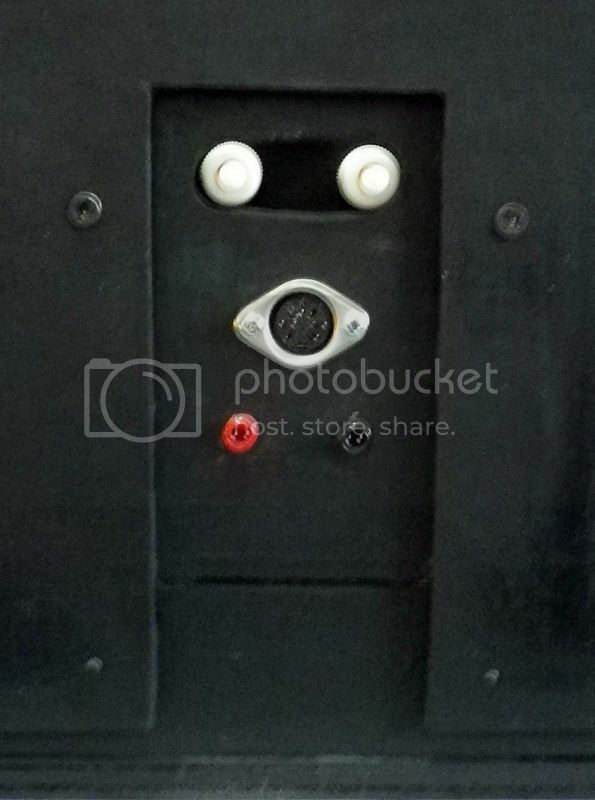 Because I stuck the gash piece of hardboard on the inside of the backscene, the 16vAC and DIN sockets are in a 3mm recess, so should be safe from knocks. Today I removed the push switches - not wired up yet - opened up the mounting holes to make a slot, and mounted the switches on another piece of hardboard set back from the backscene on two blocks. Now the push buttons just poke through to the back and don't stick out from the recess, and there is space for my big, clumsy fingers to operate them. Now that the point I stuck down yesterday is set hard I've fixed the operating wire around the slide switch slider (is there a technical term for the bit of black plastic that sticks up and you push and pull?). There is a little 'slop' so that the excess motion of the slider is taken up and doesn't put pressure on the tie bar. We're off to Devon for the weekend, so no more work can be done until next week. I shall definitely go for track-laying in the warm. It will also be done in a better light as well as comfort. A productive weekend just gone - I managed to lay all the track and wire everything up with only a modicum of shouting and swearing. 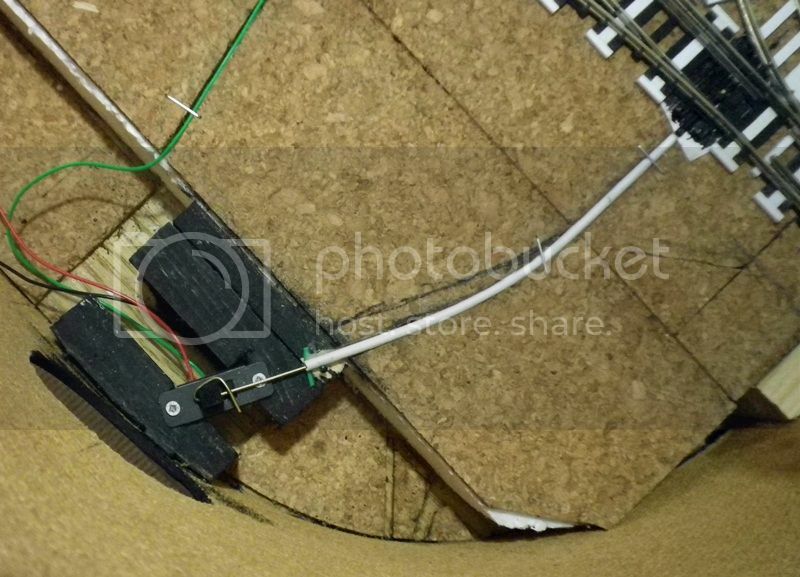 A view of the whole baseboard with track in place. Plenty of reverse curves but I've tried to make the transitions as straight as possible. How are DGs on coupling and uncoupling on curves? At the left end I've bodged up a non-working point, which is supposed to lead to the waste tip. I've made a start on changing the sleepers on the plain track to match the points, based on the Blenheim trackwork. A close-up of the faux-point. It's tight up on the for-real point, but it all works. ... and again with the point changed. 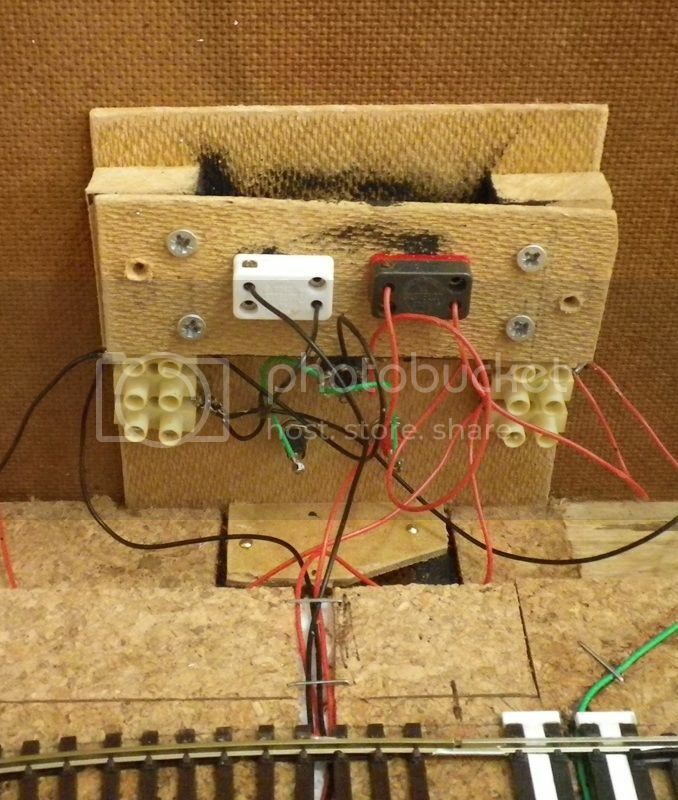 It is possible, with a bit of squinting, to see how the excess movement of the switch is taken up in the wire loop. ... and the mares-nest of wiring and bodgement behind it. However, to my great astonishment, it all worked as intended without any recourse to a hammer. I don't think I've seen it done like that before. Most others put a bend a loop shape into the wire to allow for excess movement, but I like your idea better. Easier to adjust over time. Good job on making the dummy point too. Your work is inspirational and instructional! Lots and lots of fiddly little bits of plasticard to cut and stick but it's done now. I used my trusty little guillotine to get uniform pieces - it really needs an adjustable fence for this sort of thing, but I managed to clamp a steel rule to it and moved it about until I got the lengths I wanted. The cut bits tend to ping off as they are chopped, so there were several periods of scrabbling around on the floor trying to find them all. It should look better when it's rusted up and buried in gravel. After the glue was dry I had a clean of the track, and rubbed it with the graphite stick before testing it all again. Some adjustments were needed but it's all working now. I've had to put the layout back in the garage, where it will get a cold soak tonight - it'll be interesting to see how it stands up to the forecast 0 degrees. Next job will be to paint the track.